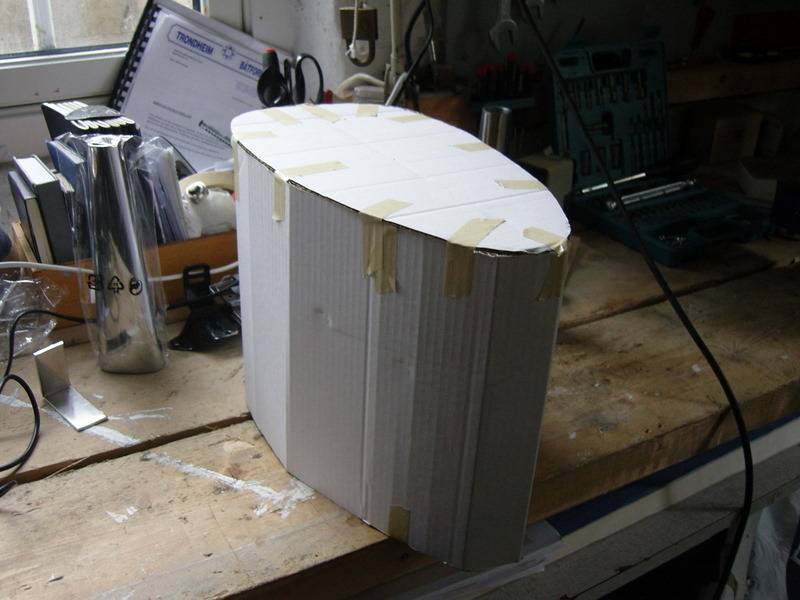 Finally the chassis for the 832A amplifier is starting to take shape. I have spent the summer thinking about how to manage heat, pull wires out to the spheres, and what the hum and interference will be like. Having decided I need forced ventilation, everything loosened and I mounted most of the chassis yesterday and today. I still have all the connectors to mount an some holes to drill. But you can see where it is headed. My youngest child named it Rudolph! 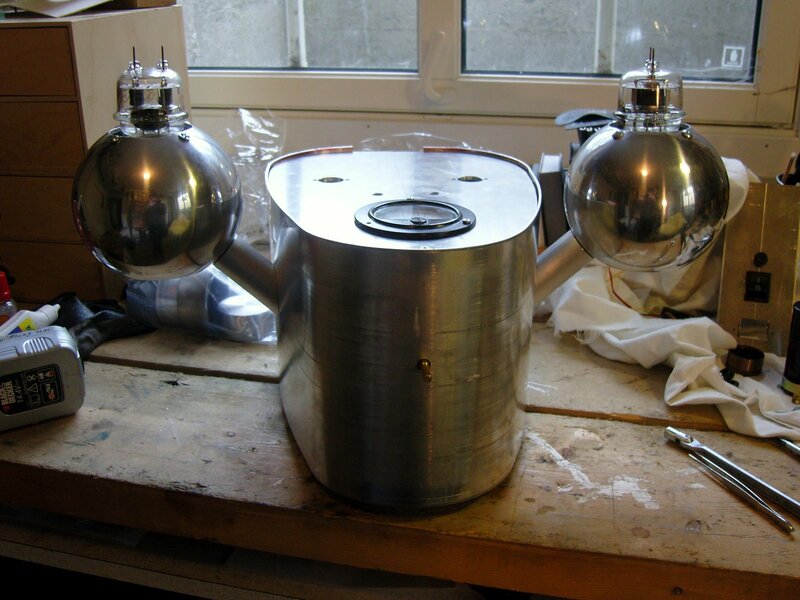 As promised in a previous post I will show how to use the larger of the two IKEA Nässjö candle holders for making a chassis for a large power tube. 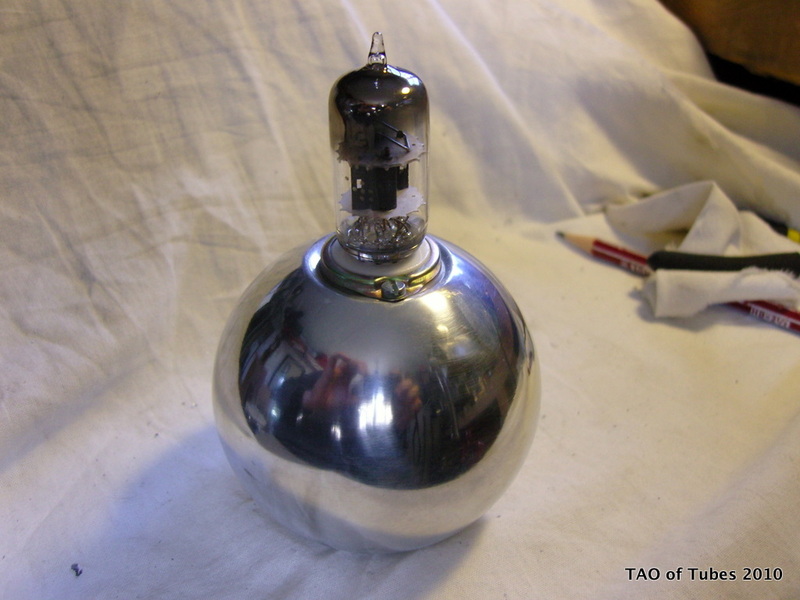 I am planning on using the 832A tube or the 6C33C tube. Both of these use septar sockets. 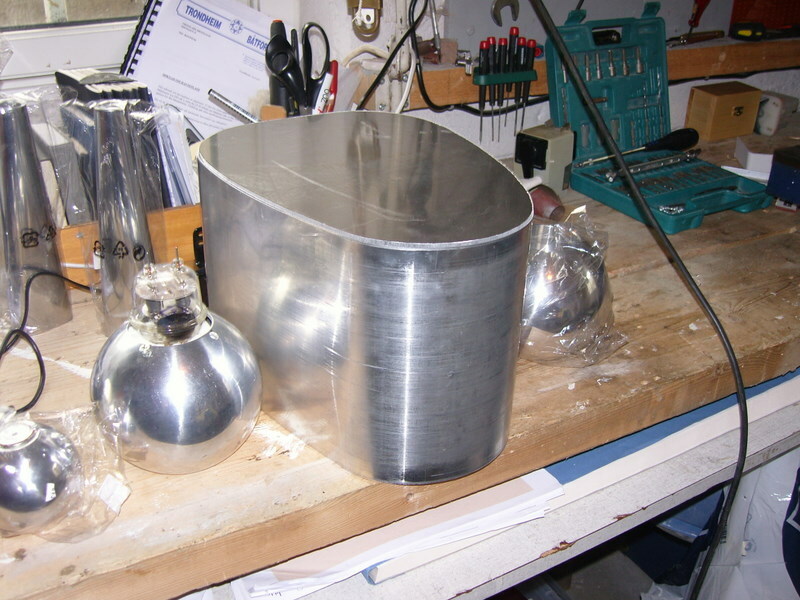 These candle holders have a large and a small cup press fitted into the molded sphere. 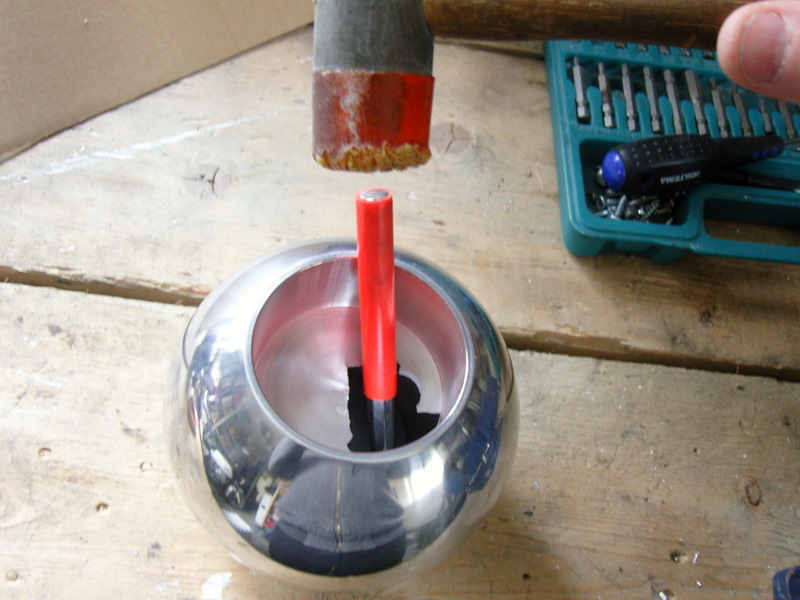 I chose to drill a hole in the smallest sphere, and use this hole for sticking in a skrew driver and tapping out the larger cup first. However, the screwdriver went right through the bottom of the cup. The material is quite thin and fragile. So I had to tap them out by hitting the edge of the cup, not the bottom. In order to do this it is best to start by drilling a hole through the largest cup and driving out the smallest cup first. 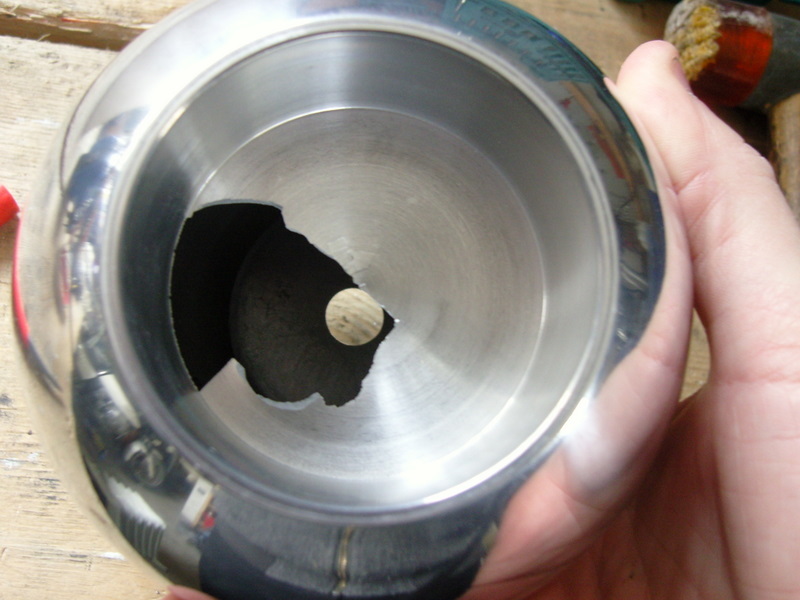 This gives more room for aiming and driving out the larger and more fragile cup last. Here are both the cups, out of the candle holder. Unlike its smaller sibling, which I mounted a socket in here, There is no internal structure that needs to be drilled away. However the large candle holder is thinner in cross section, so in this case. I had to drill holes and mount the socket with screws and nuts. 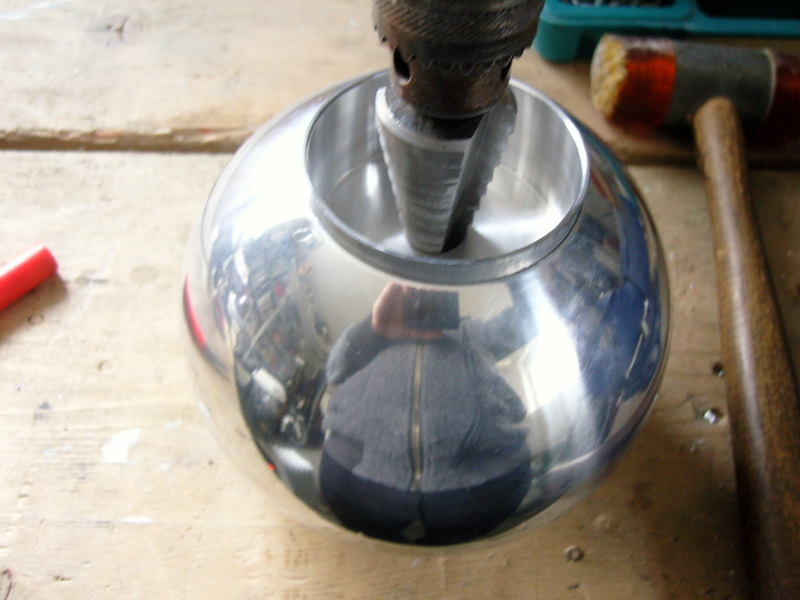 In order for the screws to fit snugly with the spherical surface I mounted them in a vice and pounded them to a suitable angle. 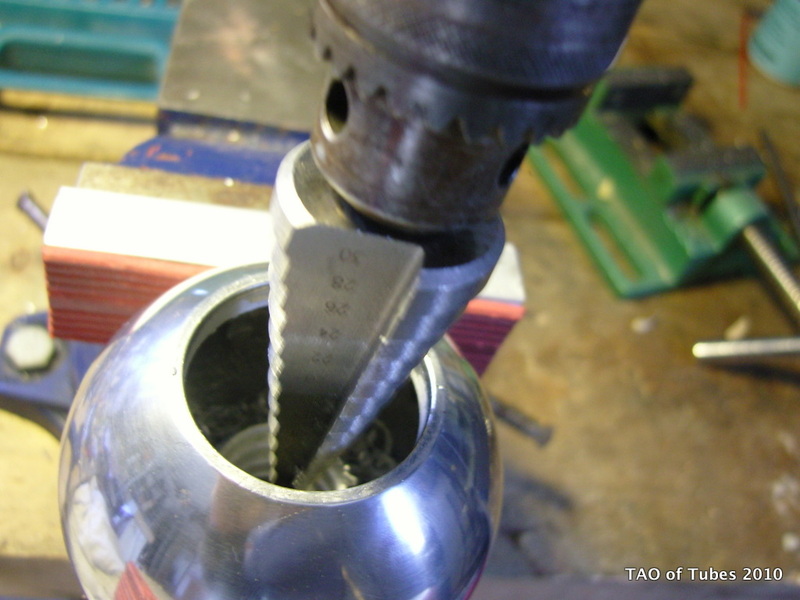 Mild steel electroplated panhead screws were used. 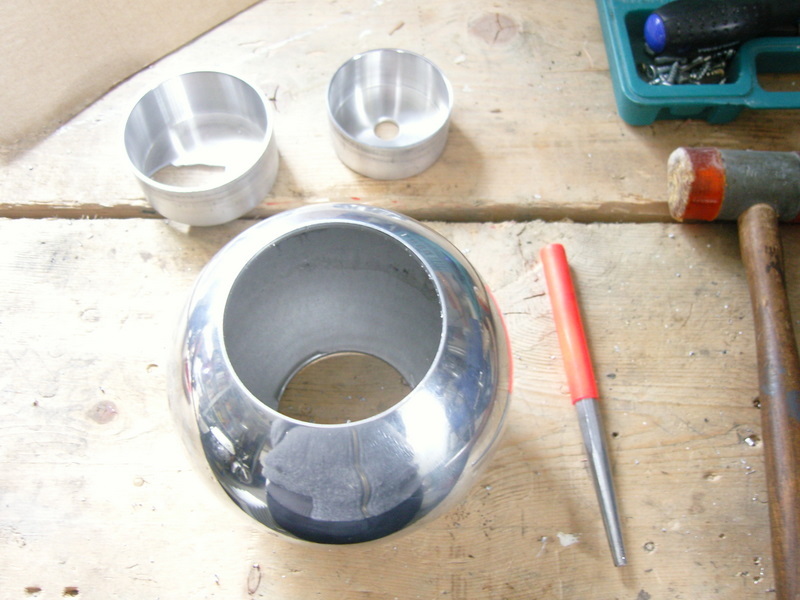 I let the socket but up against the sphere, although spacers cut at an angle may be better. 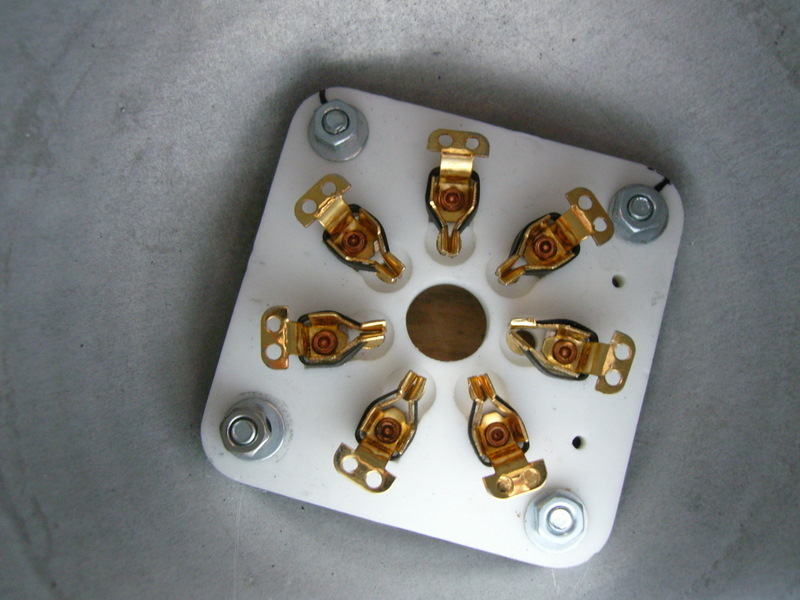 An added benefit of the sphere meeting the square socket is that there is an air gap which is necessary for cooling the 6c33c tube. I am playing with the idea of mounting a computer fan in the larger hole in the bottom to provide forced air cooling for the 6C33C. So there it is. 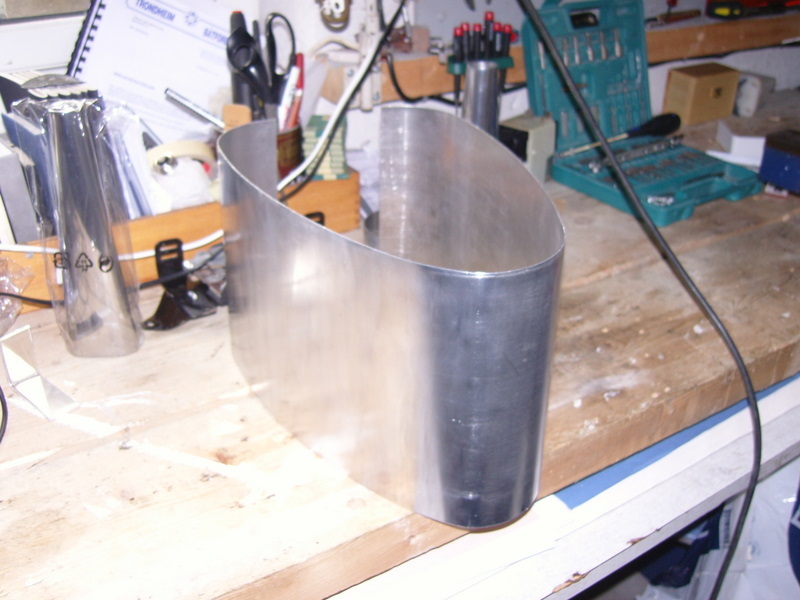 The beginnings of a forced air cooled 6C33C tube holder that can be mounted out side the chassis for max cooling and cool looks. These pictures show a form development from cardboard to thin aluminum, to 2 and 3mm thick aluminum chassis. Now I am working out the position of the major components. 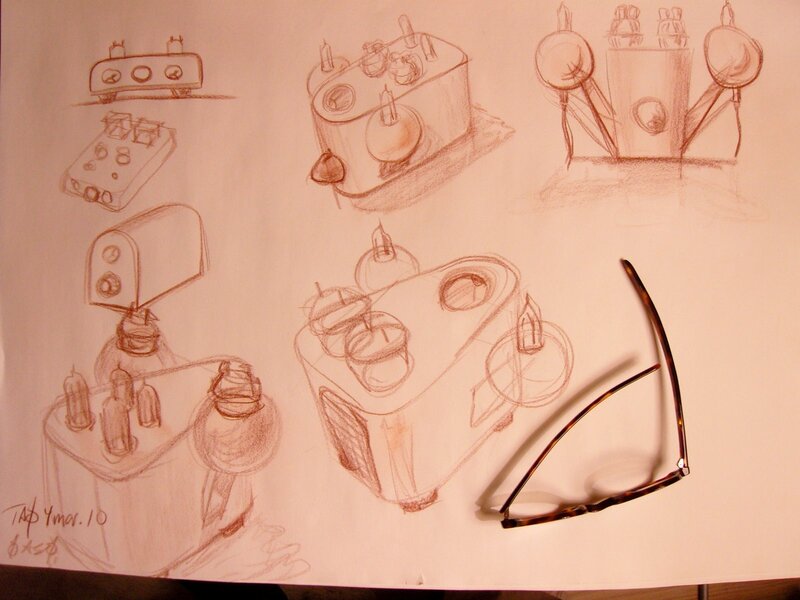 Based on the idea of building around the Ikea Candle holder, I have sketched several configurations. The bottom Left drawing is starting to look interesting. 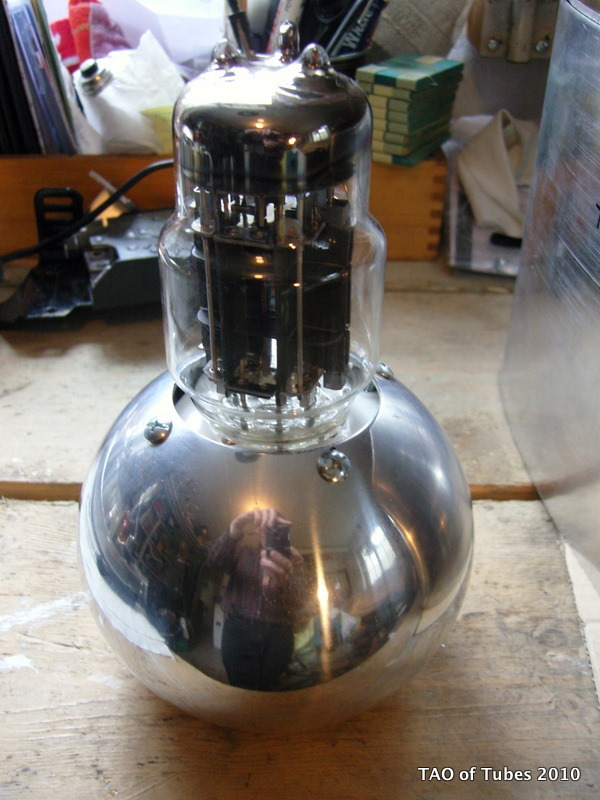 I will have to use the big Näsjö candle holders with the GU32´s. 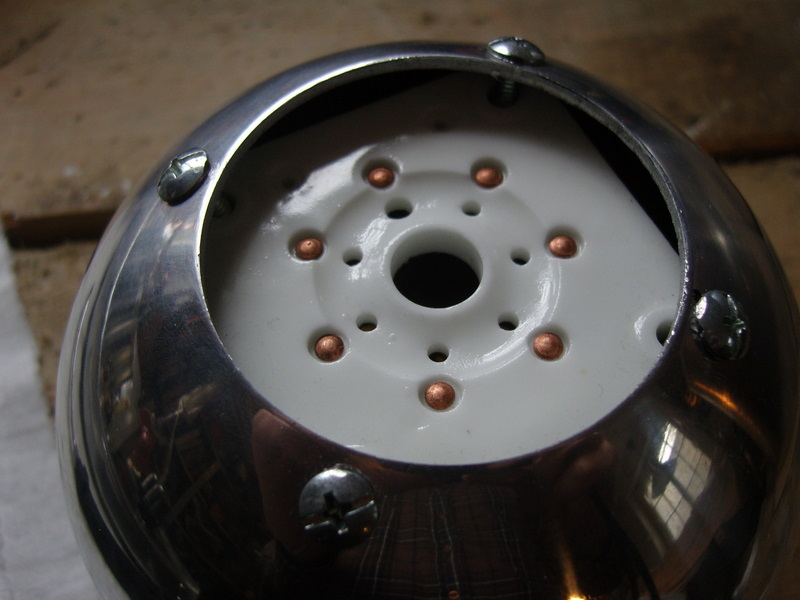 Also I want to use the Bullet shaped volume knob in the middle top. And the dramatic arms of the top right drawing. Remove the rubber bottom. It´s made of some sticky but weak glue. I used a knife. Drill out the bottom. 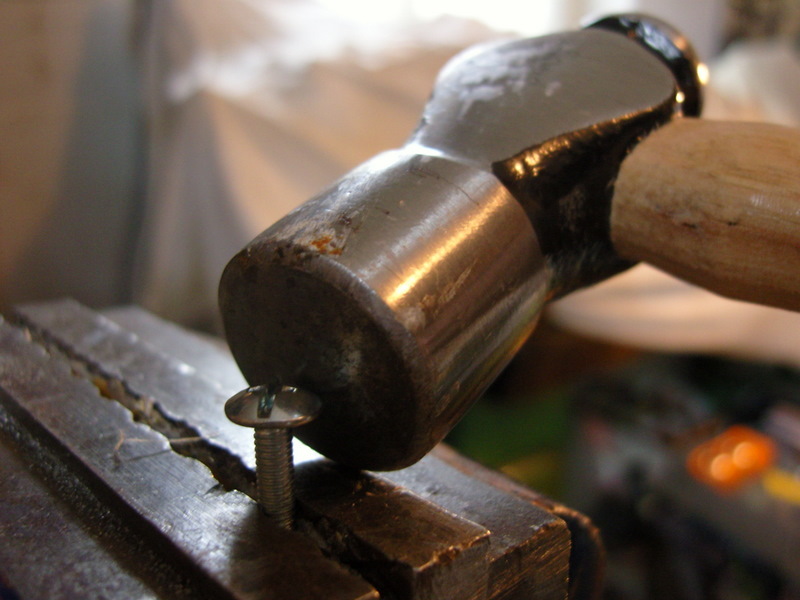 Use a drill of 6 – 10 mm so you have space for poking in a screw driver. Its pretty tough. Steel 6mm. I use rubber pads on a vice. 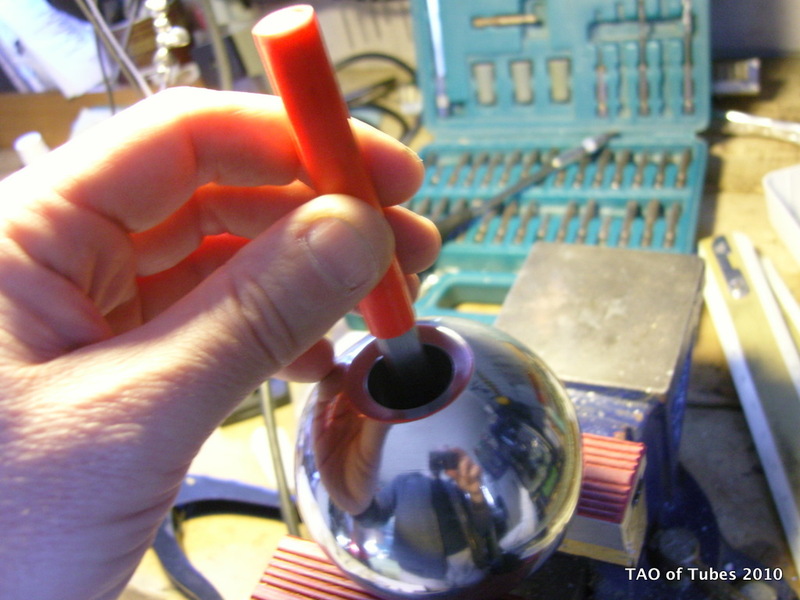 You can squeeze pretty tight the sphere made of 3-4mm molded aluminum or similar. A cool idea would be to connect the input RCA socket in this hole later on. That way it will appear as if the signal wire is connected directly into the tube. You can now easily tap out the bottom of the candle stick hole. It is a thin (1mm) piece of soft aluminum. 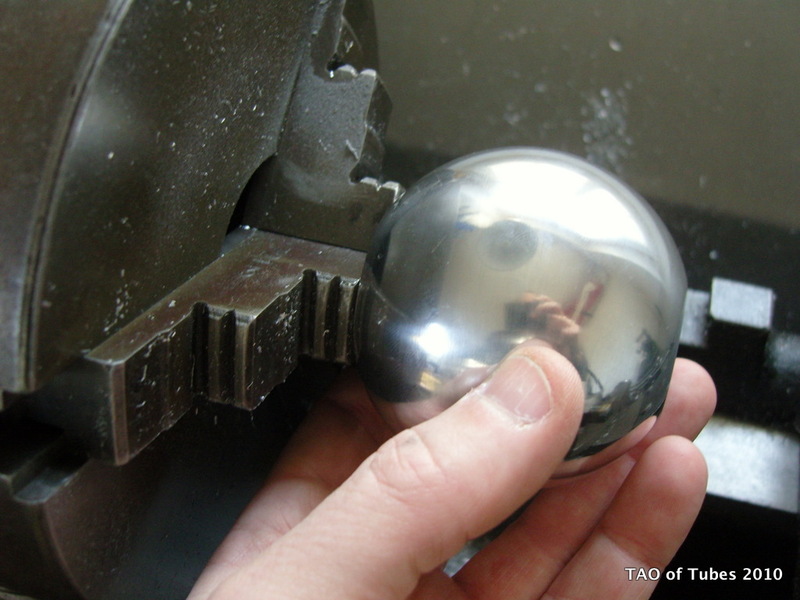 Turn the sphere over and tap out the bottom. And here it is! keep it in a safe place if you want to reuse it. 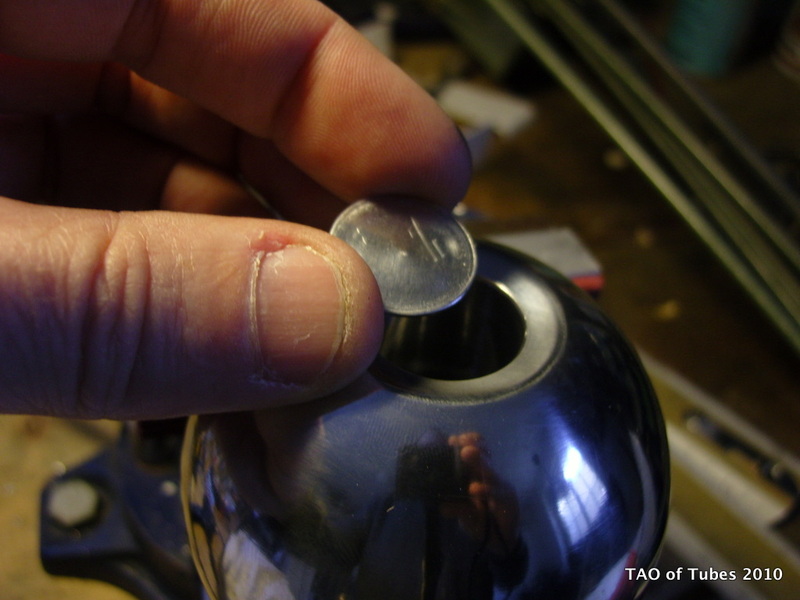 Notice that there is no edge to stop the bottom from sliding into the sphere. 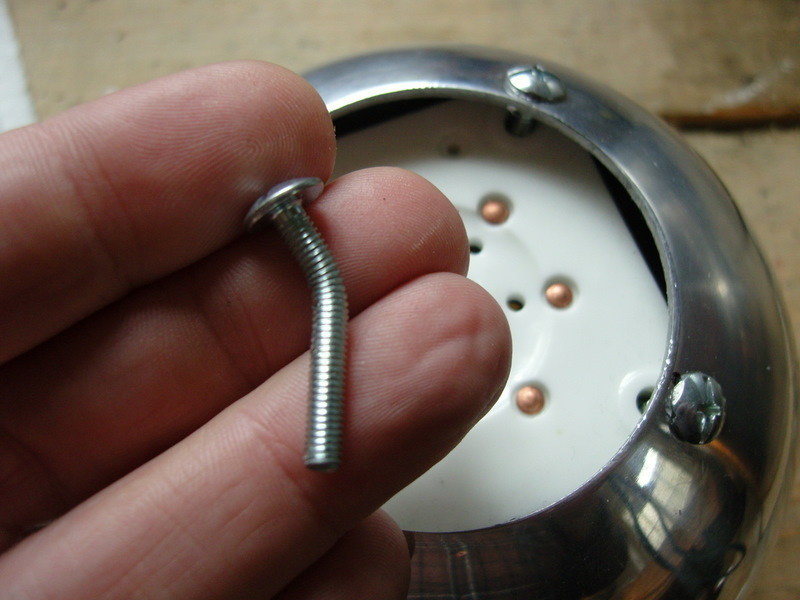 When remounting it may be an idea to use set screws to fix it in place. 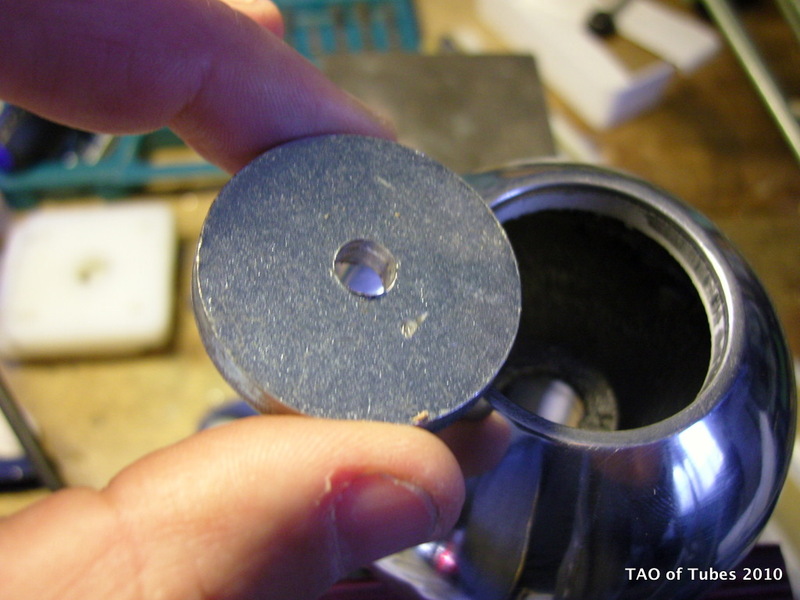 Grind down the edges a bit it you want to use set screws only. But I´ll leave those decisions until later. 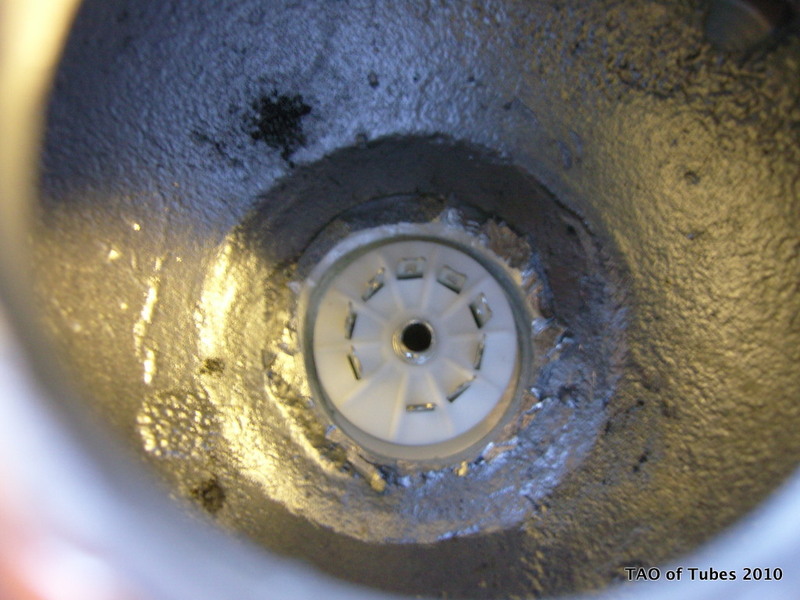 Looking into the sphere from the under side, it is apparent that there is an uneven and pretty thick tube you have to remove to make room for the tube socket and its components. If you are lucky and have a small or large lathe you might be able to mount it, and remove the central cylinder that way. Mine was exactly wrong for gripping both on the outside and on the inside, so I had to improvise. I decided to use my sheet metal drill. The aluminum is soft and this worked perfectly, almost. 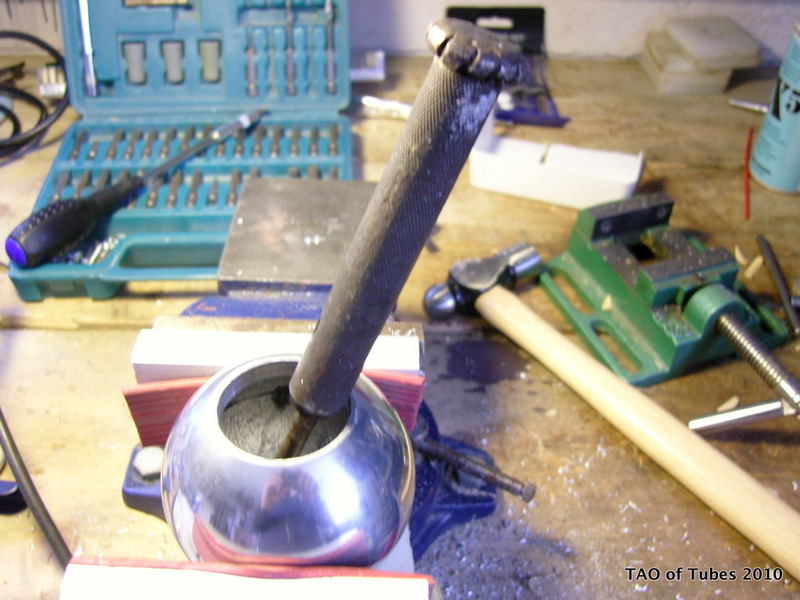 Due to the irregular diameter of the cast cylinder a bit was left over by the time I had to stop so as not to widen the out side diameter of the hole. I used a chisel and a flat steel rod for breaking of the remaining wall of the cylinder. 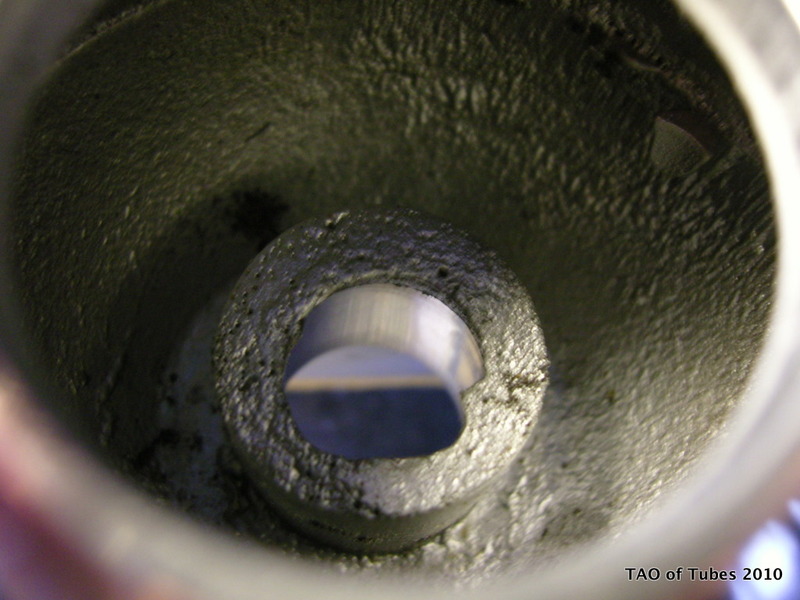 The aluminum (or whatever it is) is soft and breaks away quite easily. The original hole for the candle stick matches perfectly a nine pin miniature socket for the 12AT7 tube I am using. 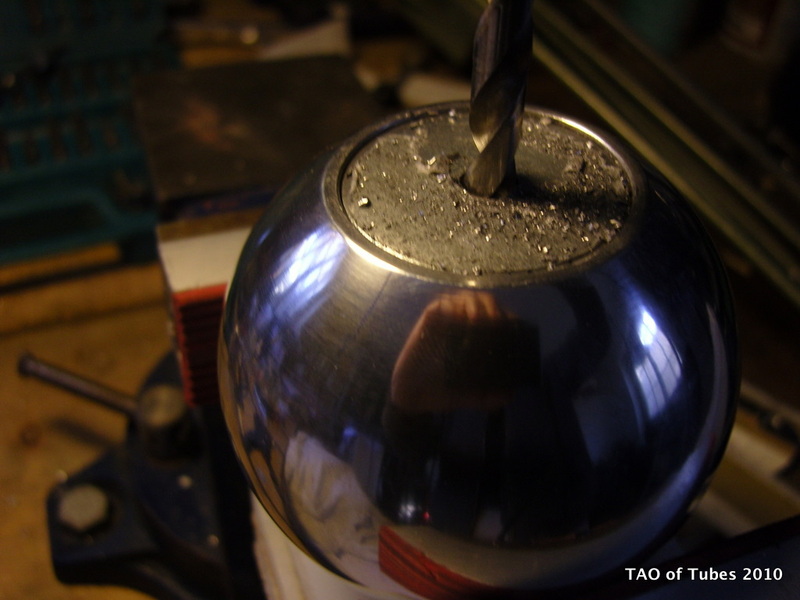 As you are drilling you can obviously open the hole more for using for instance a octal socket. Now all that remains is to drill and tap two holes for screws. I used M3 thread.